The guy at the hockey store said you have to smell the elbowpads and the shinpads. He said, “You’re welcome to go for new ones, we’ve got these here for an example, CCMs on special, but if you’re buying used, trust me, smell first.” He was wearing track pants and two baseball caps, peaks facing forward and back respectively. He said sometimes it felt like all he did all day was smell hockey equipment. We watched as he took pad after pad to his nose, holding it, inhaling like an asthmatic. “These ones don’t stink so much,” he said, finally. This was the week we went to buy Zac his hockey equipment. He has his first practice on Saturday. I’ve told him the things a father tells his son as he starts in playing hockey: that if you speak the names of the hockey sticks aloud, Koho, Karhu, Titan, Sherwood, they can sound like a fellowship of adventurers, such as in The Hobbit or The Lord of the Rings; that I was there at Maple Leaf Gardens the night Darryl Sittler scored ten points. I told him, remember: two hands on the stick and pick up your winger. What I didn’t mention was that according to my dad his — Zac’s — hockey destiny has already been written. 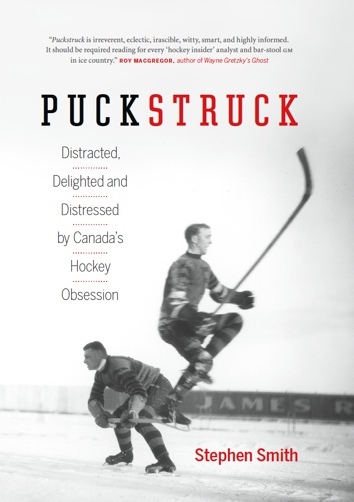 In the 1950s my dad went around Europe with the Oxford University team, mostly they were Canadians, playing out in the open air, on Alpen rinks in Bolzano, Garmisch-Partenkirchen, Lugano. The Queen of Holland shared their bench, once, through a snowstorm. My dad played defence. He was long and loping: you can see it in the pictures. His nickname was “Smoothy:” it’s harder to see that. I used to love unpacking his old equipment from its duffel-bag in the basement. The shinpads with their leather kneecaps. The cloth pants stiffened with — whalebone, maybe? His complicated gloves, huge in their armour, like gauntlets Cortes might have thrown down goading Aztecs. I’d hoped to wear this stuff. I had to, I thought. The game wouldn’t be the same unless I went into it wearing this exact stuff. I’m imagining how my dad responded to this fancy of mine: fondly, with forbearance, rolling his eyes, if only mentally. He might have said, My stuff doesn’t fit you. I don’t think he would have said, Look at the mildew, son, we have no way of knowing what the molds and moistures and various proteins of decay will do to the health of a young boy. He could have said that, though. It would have been true. And so, one afternoon in the early 1970s, we went to buy me new equipment. I had hair down over my eyebrows. I would have been wearing the brash Madras shirt that lasted me most of that decade. We parked in back of Fontaine Sports and Cycle on Queen Street. Inside they had the bikes hanging from the ceiling like big sleeping bats. Mr. Fontaine himself helped us out. He wore a cardigan. He had a pencil slanted in behind one ear, and interesting eyebrows. I don’t think I’m making that up. The boy, his father, the kindly shopkeeper — it would be good to say that we passed through a secret door, that day, into a protected place, a timeless place, a Canadian place, sort of like a national park, but without the wildlife. But I remember no such door, though, no park, no missing wildlife. I remember the CCM helmet I got, no mask to protect my face from the fast harm of pucks and skates, only a mouthguard. And I recall walking out of Fontaine’s near to tears, in an awful snit, my dad having refused to buy me reproduction Montreal Canadiens socks and sweater. All Saints Anglicans Atoms, circa a long time ago. I’m pretty sure the way he understood it was this: in the matter of sweater and socks, the All Saints Anglican Atoms would provide. And they did — a black sweater with a blocky white A on it, black socks banded red and white. It just took a while. Did my parents mean to afflict and embarrass me with the uniform they improvised until we got our real ones? I have to trust that they didn’t. 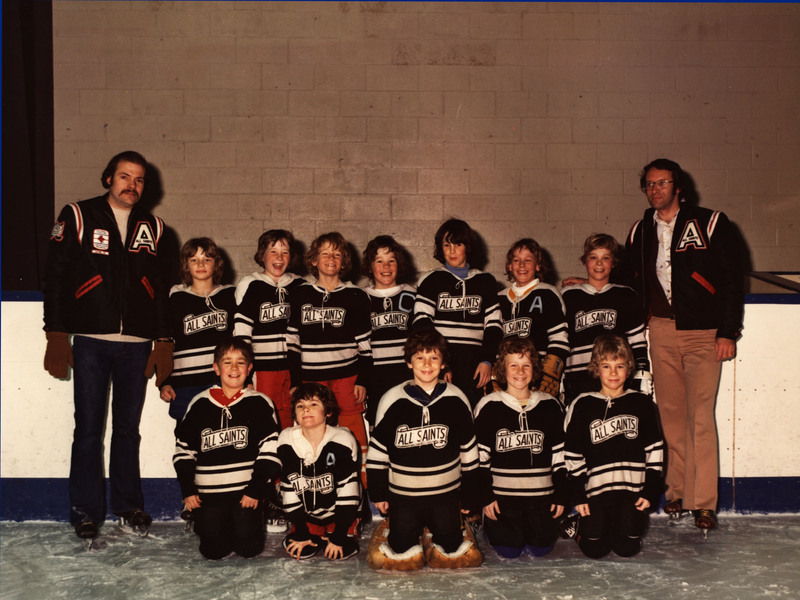 But let the record show that for the first three games of my hockey career I skated the wing wearing an old oiled Irish fisherman’s sweater and the green wool stockings my mom used for cross-country skiing. The sweater was patterned the way Irish sweaters are, except more. It was a museum of knitting, a hall of knitting fame, row on row of plaits, textured twirls, inlaid columns, arabesques, all heavy as chainmail. The ski-socks were an alien green, heavily pilled. Appalling. It would be crazy to blame that early trauma for my subsequent lack of hockey fame and long-term bonus-laden NHL contracts. The fact is I’m just not that good. You’ve heard talk on Hockey Night in Canada of soft hands, great wheels, puck sense? I have palms of stone, missing spokes, and a headache, respectively. If there’s anything I bring to the table, the hockey table, it’s reach. Did I feel better when I learned, years later, that there’s a perfectly good reason for my mediocrity? Okay, yes, a little. Here’s what my dad didn’t tell me that day: when it comes to hockey, the men of our blood get worse and worse with each passing generation. It’s out of our hands. This is just the way it is. He explained it to me about ten years ago. He took me aside and he told me. We hadn’t really been aside before, so I knew it was important when he took me there. Part of his presentation went like this: Your grandfather was a pretty fair winger, Chicago owned his rights, which says something. Nobody owned my rights, but if they had they would have owned one of the quicker wrist-shots at Oxford. You … You have your reach. You see what I’m saying here? I did. It made some sense. Think of a chunk of ore, dense with the secret skills of the forecheck, veins of deking savvy. This is what my grandfather got. Only it wasn’t as mineral as it seemed at first. When the time came for my dad to play, the chunk was found to be smaller and sadder. Like the polar ice-caps, the mass of our hockey talent has been melting and melting. Zac is about to start his career on ice. You see what I’m saying here? I don’t know. At home the other night, after we got back from buying equipment, Zac stood in the dining room and we tried it on. He said: “Aren’t hockey pants just for goalies? Are you sure?” He laughed to be so bulky, and he went walking into the walls to try out his padding. I told him what Steve Yzerman says about taking face-offs, you watch the linesman’s knuckles and when they change colour from white back to red that’s when you know the puck is dropping. Zac looked at me for a moment like someone who’s been lost, and then he went walking into the wall to try out his padding. They say through our children we try to grasp back the youth we’ve lost, the dreams that have drifted. I can’t see Russian hockey camps, though, or hiding pucks. I won’t be yelling from the stands, stick on the ice, shoot, shoot, shoot. We’ll drive to the rink on Saturday mornings, early, and I’ll lace up his skates and Velcro his neckguard for him. I’ll stand in the stands with a coffee. When, trundling down the wing, Zac leaves the puck for whoever might want it to take his hand off his stick so he can wave to me, I’ll wave back. All I can do after that is see that his elbowpads don’t start to stink.